This is a perfect entrée for a springtime dinner or any time of year when you are looking for a fresh taste of spring. Scallops are being used, but you can use the seafood of your choice or eat as is. Sea scallops are large and 2 -3 are about a right serving per person. Lemon Infused Extra Virgin Olive Oil is being used and can be purchased on-line at Spicewood Food Company. Serves 4. Using a large skillet add lemon infused olive oil and sauté the onions over medium high heat until translucent. Add the garlic and risotto and stir for about a minute. Add white wine and stir. Add stock about 1 cup at a time. Add lemon juice. Stir frequently, adding stock when most has been absorbed. This process takes about 30 minutes. When risotto is tender, stir in Parmesan cheese and lemon zest. 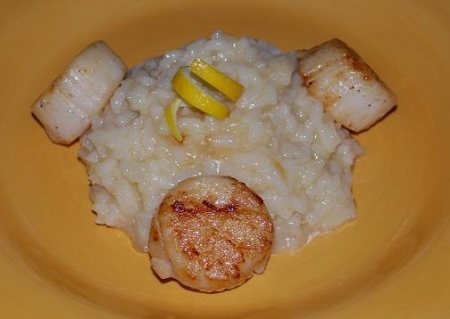 During the last 15 minutes of the risotto cooking process make the scallops. Rinse and pat the scallops dry and season with salt and pepper. Preheat a large skillet over medium high heat and add lemon infused olive oil. Once oil starts to sizzle add scallops. Do not over crowd the pan or the scallops won’t sear. So you may need to sear them in batches. Add scallops and cover and sear for 4 minutes. Turn, cover, and cook for an additional 4 minutes. Once risotto is done, ladle into bowls and top with scallops. Try Salneval Albariño Rίas Baixas Cosecha White Wine Valle Del Salnes (Spain), Pomelo Sauvignon Blanc (California), Villa Maria Chardonnay Private Bin (Marlborough, New Zealand), Fleur du Cap Chardonnay (Western Cape, South Africa), Paulaner Hefe-Weizen (Germany) with a lemon wedge or Samuel Adams® Hefeweizen (Boston, MA) with a lemon wedge.